After spending several weeks with the Infant Optics DXR-8 baby monitor, I’m unsure how I’d have survived at my baby’s current stage without it. The screen is great, the options are easy to navigate, and being able to manipulate the angle from the control screen grants excellent peace of mind. The Infant Optics DXR-8 baby monitor is an excellent choice. My wife and I have a nine month-old son and he’s our first child. We did the phase where he slept next to our bed in his bassinet. We’ve co-slept with him. We take naps together. But, despite how comfy and easy it is, we know it’s time we get him used to sleeping in his own crib. I’m not sure we would be able to mentally do that if it weren’t for the Infant Optics DXR-8 baby monitor, or at least something like this. With this monitor I can plug it in and leave it next to the bed while he sleeps, check the screen to see if he’s okay if I hear noises, or even just turn off the screen and use it like any other audio monitor. And, since our kid is a squirmer, being able to easily rotate and pan the camera using the directional buttons on the handheld viewing screen is a life saver. Honestly, I’m not sure how parents managed to not go insane with worry when leaving their baby alone in a crib before monitors like this existed. It’s worth every penny. With the Infant Optics DXR-8 you get two parts: the camera and the handheld viewing screen (as seen in the photo above). The camera itself is of good quality with three different lenses you can quickly swap in and out: a standard lens, a zoomed in higher resolution lens, and a wide angle lens. Swapping them out is super fast and simple as they just screw right in. As far as I can tell thus far in my testing, the camera is made of a very sturdy quality. It’s fallen off the edge of my son’s crib on multiple occasions from him flipping and turning and standing at the bars. And, while his room is carpeted, that tumble is still several feet high and it hasn’t had any issues at all. The handheld viewer has a 3.5-inch LCD screen with a great, clear image,even if it isn’t HD. There’s an antenna in the back that folds open to increase the signal range. The circular button in the middle of the control panel on the right lets you select menu options, as well as adjust settings like the volume or brightness. At the very top there’s a power button that you press and hold to turn on and off, or tap to turn off the screen and use it in audio only mode. The camera can be rotated remotely from the handheld screen to move left, right, up and down. However, it’s got limited mobility. For example, while pointed at the inside of my son’s crib with the normal lens, it would sometimes lose track of him if he stood up at one side or rolled down to another corner. It would have been nice to be able to move the lens a little bit more. From the handheld’s menu you can adjust the volume within a large range (one or two notches is high enough to hear if it’s nearby and the top notch is very, very loud) plus there are indicator lights along the left edge. This is great because even if it’s muted, the light will alert you to loud sounds, such as your baby’s cry. You can also change brightness settings, set the screen to automatically turn off after a set period of time, zoom in, and more. Along the top of the screen you can see the signal strength, whether it’s in night vision mode or not, battery life, and the room’s temperature. It honestly does just about everything I’d ever want a device like this to do. Once you plug it in everything automatically syncs up, which makes moving the camera a breeze if it isn’t mounted on the wall. Switching between night and day mode is also dynamic and totally silent, which means not alerting baby at all. 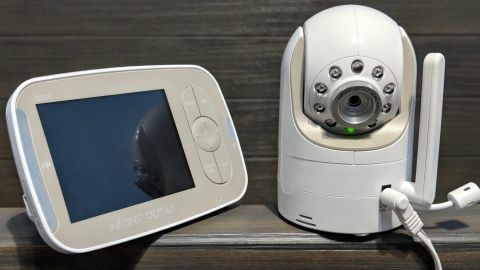 The Infant Optics DXR-8 baby monitor does just about everything you’d ever want a baby monitor to do without any of the confusion. The handheld viewing screen is bright, even on the lowest brightness setting, with a great speaker on the back for listening to your little one. It’d be nice to have a bit more range of movement on camera rotations, or a mobile app for remote viewing, but everything else is top-of-the-line. This is an easy recommendation for an all-around solid camera baby monitor system.